This time it’s a big wave session at Jaws on the Hawaiian Island of Maui that is the subject of a quad copter/GoPro video, shot by Justin Brown. 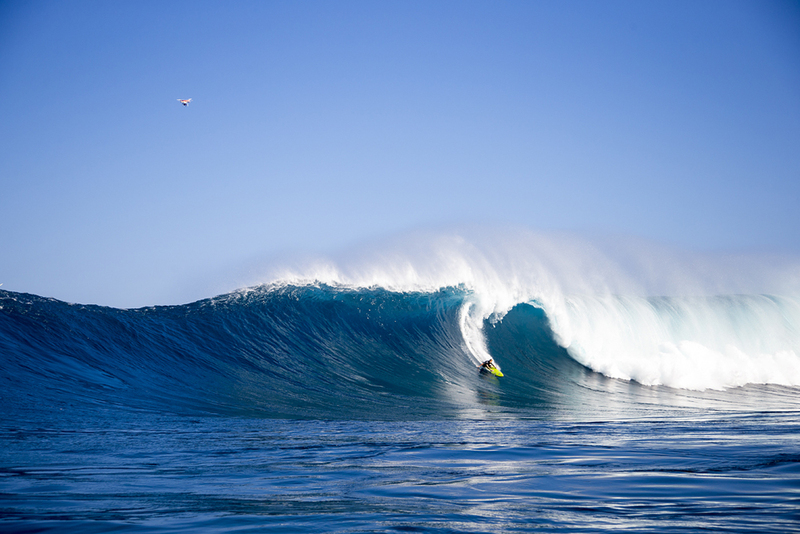 EPIC PEAHI AERIAL SURF VIDEO 1-19-2014 from AERIAL 808 on Vimeo. You might have noticed the drone in the shot when browsing some of the photo’s of the session that popped up on line recently. It’s hard for me to imagine how the scale of the waves would affect the flight, the only times I’ve used my Blade 350QX and GoPro over the surf the waves have been small by normal standards, these giant waves obviously bring up more issues, like getting close enough for the wide angle lens to show some detail whilst avoiding the spray, and not being able to see the rest of the waves in the set from your position on the ground. The gear used this time was a bit harder to track down than the recent Pipe aerial video, from the photo’s it definitely looks like a DJI Phantom quad copter, one of the tags on the Vimeo page is GoPro 3, revealing the camera used. One of the comments on vimeo mentions FatShark goggles, these are for first person view (FPV) flying, they receive a video stream which is transmitted live from the quad copters camera so the pilot can see in first person what’s going on. I love that this has been shot by an amateur videographer apparently for fun, there’s no sponsors, the only other video on the vimeo channel is a nice chilled out look at glass blowing, this video has had over 46 thousand plays so far in the 1 day it’s been available, the availability of this technology and the willingness of keen hobbyists to shoot this kind of video and put it up for everyone to see is just awesome. It’s inspired me to make a bit more use of my quad copter, and maybe look again at investing in an FPV set-up, for starters I’m going to make sure I can take it with me on my upcoming holiday.